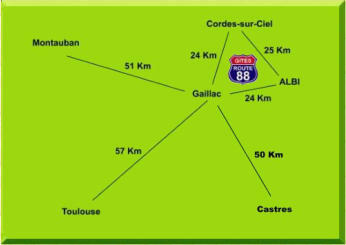 Welcome to Route 88 flats On an area of 2 hectares located in the golden triangle Albi, Gaillac, Cordes-sur-Ciel. Experience the quiet edge of the Tarn, and yet the shops and the town of Gaillac are all nearby. The comfortable apartment for 5 people includes a silent air conditioning. Cyclists, fishermen, collectors of all kinds are welcome, here we love the vintage. You can find information about what the riches of the Tarn, Cordes-sur-Ciel, Puycelsi, Bruniquel, Penne etc. If you need transport (railway station, airport), sightseeing or winery in peace, remember our activity VTC Touristic Vintage Cars. 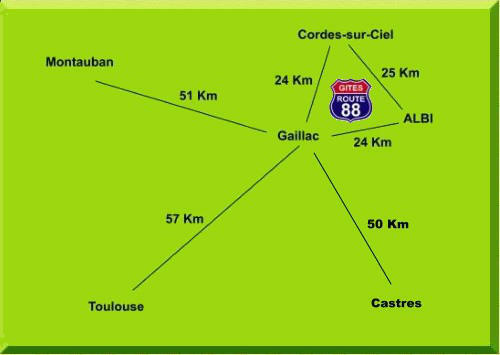 Welcome to Route 88 flats On an area of 2 hectares located in the golden triangle Albi, Gaillac, Cordes- sur-Ciel. Experience the quiet edge of the Tarn, and yet the shops and the town of Gaillac are all nearby. The comfortable apartment for 5 people includes a silent air conditioning. Cyclists, fishermen, collectors of all kinds are welcome, here we love the vintage. You can find information about what the riches of the Tarn, Cordes-sur-Ciel, Puycelsi, Bruniquel, Penne etc. If you need transport (railway station, airport), sightseeing or winery in peace, remember our activity VTC Touristic Vintage Cars.